A lupin that will really knock your socks off and will make you the envy of your gardening friends and neighbours! This amazing Lupin certainly has the wow factor, being smothered in bi-colour, pastel-yellow and vivid purple flowers, right to the top of their stems. With palmate, sage green foliage creating the perfect backdrop for these eye-catching flowers, making a stunning statement in your garden. Why not cut the stems and bring indoors to create beautiful cut flower displays?! Supplied as an established plant in a 11cm pot and ready to plant out, this lupin is easy to grow and care for and will grow to around 1m x 1m. The tall, stately spires of lupins are a real summer garden classic, and this Hardy Lupin ‘Manhattan Lights’ will really knock your socks off and will make you the envy of your gardening friends and neighbours! A real work of art, and standing tall at roughly 1m once fully grown, this amazing Lupin certainly has the wow factor, being smothered in bi-colour, pastel-yellow and vivid purple flowers, right to the top of their stems. With palmate, sage green foliage creating the perfect backdrop for these eye-catching flowers, their tall, spiky display of blooms really stand out in beds and borders, making a stunning statement in your garden. Compact growth means that they're also perfect in pots, and great for creating focal features on patios and decking - or why not cut the stems and bring indoors to create beautiful cut flower displays?! Flowering throughout June and July, the perfect blooms of Lupin ‘Manhattan Lights’ open in succession from the bottom of the spire upwards, prolonging the flowering season, and are a magnet to butterflies, bees and other beneficial pollinating insects making your summer garden a haven for wildlife. Easy to grow and totally winter hardy, Manhattan Lights is also easy to maintain and makes the perfect cottage garden plant - it's perennial so comes back year after year with an ever-increasing amount of blooms. 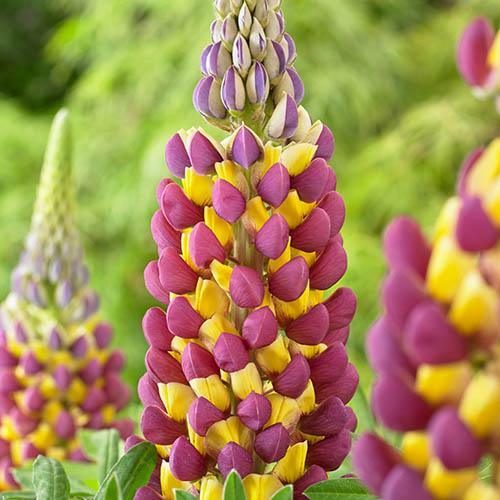 Supplied as an established plant in a 11cm pot and ready to plant out, this lupin will grow to around 1m x 1m and works spectacularly when planted alongside old fashioned English roses and hardy geraniums. Supplied as a potted plant in 11cm pot ready to plant straight out. The Secret to Success with lupins is to leave them alone. They don’t like being vigorously pruned or cut back, so only remove flower spikes once they have faded to encourage further blooming and don’t allow any seed pods to develop. Easy to look after, just keep an eye out for slugs, and leave foliage to die back naturally in the autumn. Lupins prefer to be grown in full sun with some afternoon shade to protect them from the heat of hot, midday sun. Grow in any soil as long as it is free draining and rich in organic matter. Pot-grown lupins can be planted at any time of the year as long as the soil is not waterlogged or frozen. Dig a planting hole 3 x wider than the roots and mix some well-rotted compost or manure with the soil from the hole and use this to re-fill one the plant is in place. Remove your lupin from its pot and tease out a few of the roots. Firm in the soil with your heel, avoiding the root ball and then water well. Water 'Manhattan Lights' well and regularly for the first few months. Apply a generous layer of mulch around the base of the plant after planting and thereafter annually to keep the roots cool. Lupins are nitrogen fixers, storing Nitrogen in specially adapted root nodules so don't need specialist feeding. Lupins don’t like being vigorously pruned or cut back, so only remove flower spikes once they have faded to encourage further blooming and don’t allow any seed pods to develop. Leave foliage to die back naturally in the autumn.